It’s been cookie week in our house. We’ve made ginger cookies, and cherry cookies, and fudge crinkle cookies, and even made-up cookies. Confession Time: I could make cookies until next Christmas. 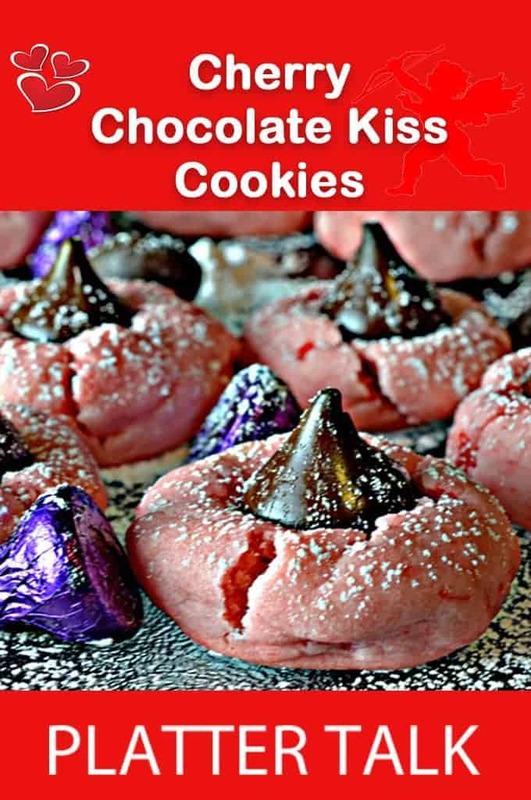 Click here for one of Cupid’s Favorite Cookies! Be sure and click the photo above for one of our latest cookie creations! Just to keep thing interesting, this post is not about a cookie per se, perhaps something more between a cookie and a pie. 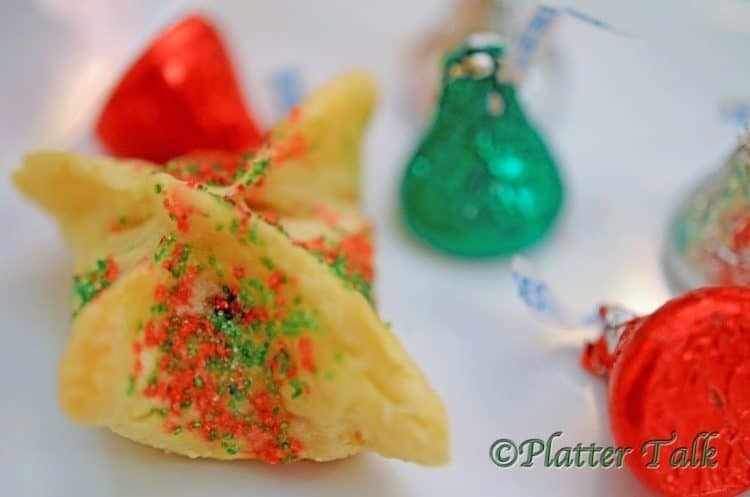 Yes, this post is about Holiday Wonton Kisses. Let’s face it, this time of year in particular, our pantries are stocked. With all the fixings for our favoite cookies, a pie here and there, and of course an over abundance of confectons, the sky seems to be the limit with what we can put togeteher to keep our ovens and stove tops in good use. 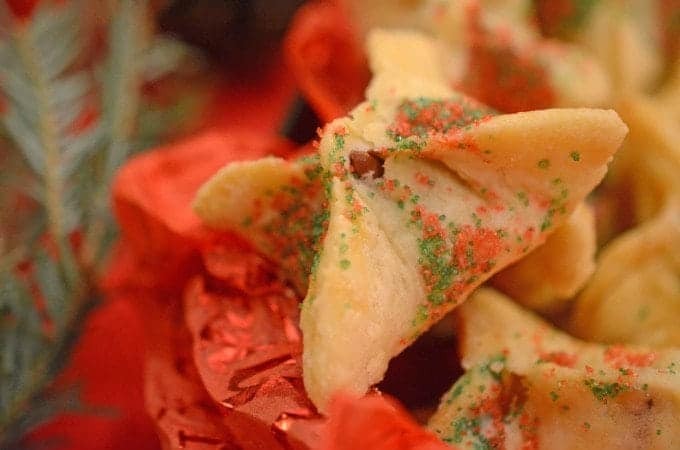 These wonton kisses are a hybrid of sorts. Part pie, part candy, and part cookie. Sounds like a veritable trifecta, if you will. 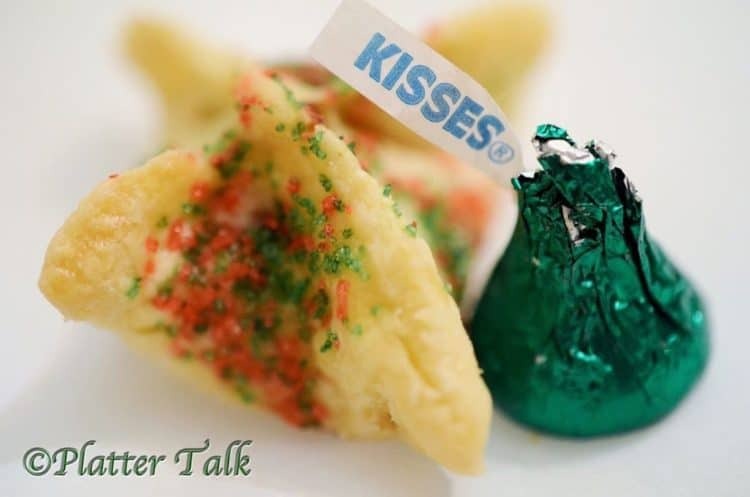 Just two simple and classic holiay components make up these bite-size treats: Pie pastry and Hershey Kisses. 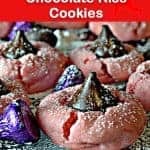 To make them, you can simply purchase a refrigerated pie crust from the store (unless you’re me) and a package of Hershey Kisses. I found some pie crusts inside the coolers of my favorite grocery store. I even held them in my hands. Yet, I just could not do it. Call me crazy, perhaphs it’s the lingering Mennonite in me – I can’t say for certain. However, I can say this, given the choice betweeen commerically prepared and frozen versus 3 cups of flour and a half cup of shortening form my own pantry, along with a couple of other ingredients, I’m going to mix it up myself. Every. Single. Time. 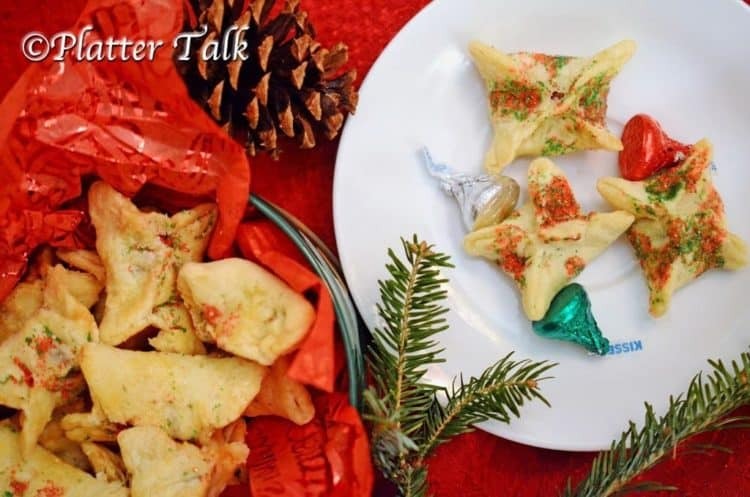 Link here for a live television demonstration of this recipe from The Guys from Platter Talk! Thaw pie crusts and roll to 1/4 inch thickness on lightly floured, clean surface. Use drinking glass or coffee mug with 3 - 3/12 inch diameter, or cookie cutter of similar size, score and cut dough. 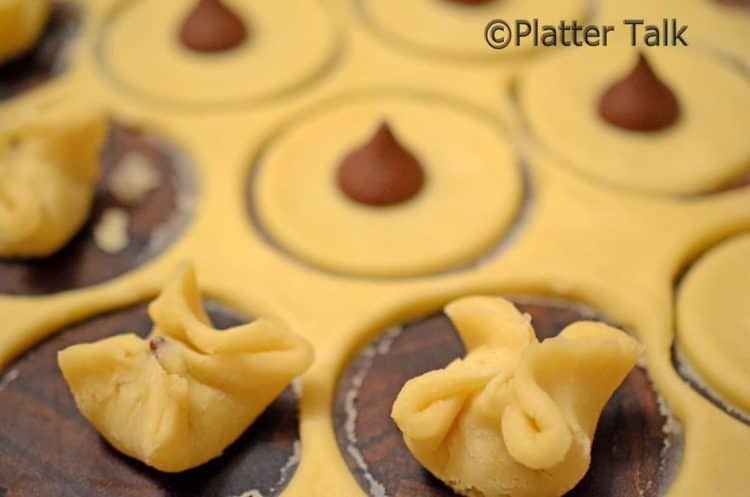 Create wonton by folding opposing sides of dough around chocolate, seal each end by pinching dough together tightly. Place on ungreased cookie sheet or baking stone. 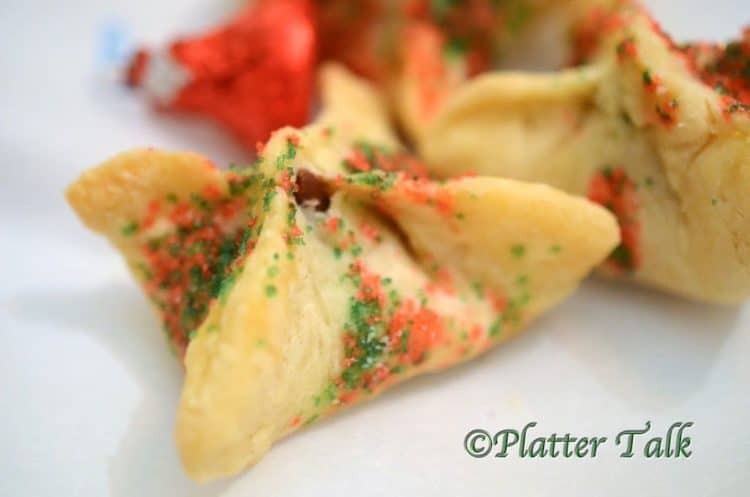 Brush each wonton with egg wash, and sprinkle with colored sugar. Place wontons on cooling rack. Want to make your own crust? Check out my pie dough recipe at the end of this post. What a sweet, simple and wonderful little treat! I love these! These look so yummy! Thank you for sharing on Show Me Saturday! These are such a great idea! I love finding a fun new Holiday treat to try. Hi guys! First, I thought about savory wontons! and what a surprise- cookies! Lovely idea, they look perfect! Thanks so much for comments, Mila, hope you give these a try! Such a cute idea, and easy too. Might try with the caramel filled kisses. Oh goodness! These look very decadent! I might have to make a few (or a lot more!!) Thanks for sharing!! What a great idea! And I am with you on the store bought pie crust. These are just great! Pinned it! Found your blog on Inspiration Monday and started following on Pinterest. These are sooo cute. I was trying to find some cute and fun for our Ladies Christmas Party at church and these would be PERFECT. I am sure they will love them. We would love for you to share with everyone at Party in Your Pjs. Thanks, Kim. And – yes, these would be perfect for your function at church. Enjoy! YUM! These look so yummy and festive. I like that you could add any kind of chocolate kiss and it would be amazing! Thanks, Erin. 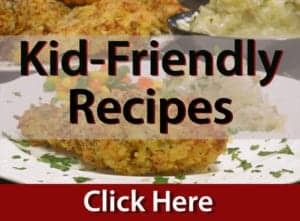 These are fun to make and fun to eat! Yummy!!! 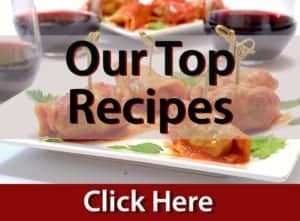 I have some wonton wrappers on hand, can they be used and baked or do they need to be fried? The pie crust and cookie dough sounds wonderful to me. Thanks for the recipe. Thanks for the comments and question. 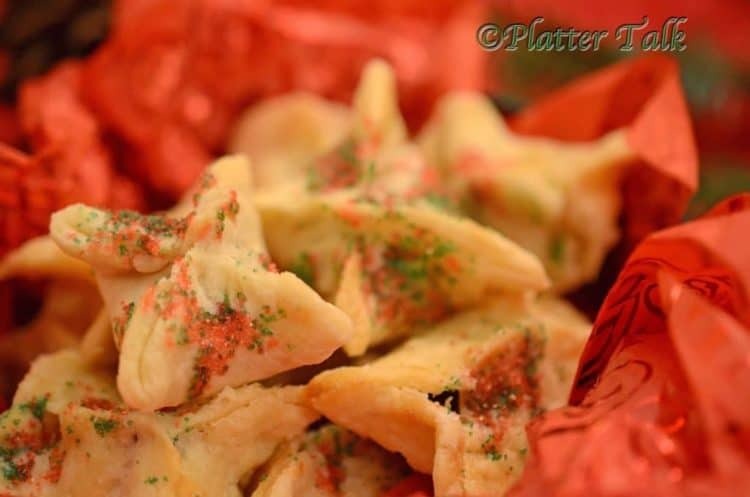 Since these wontons are made from pie pastry, they are baked. I’m not sure about commercially prepared wonton wrappers but there’ no harm in sticking a couple in the oven to see what happens! Let me know, I would love to see how they do. I don’t like pie crust, but I’d bet this would work w/ sugar cookie dough too! I love your idea – I hope you go with it!! It’s so fun and rewarding to let your creativity guide you in the kitchen. Thanks for the comments! Oh, my! I could bake Christmas cookies all year as well, Dan! These cookies are not only creative, they remind me of chocolate filled croissant or brioche. You have me thinking I should try this recipe with my flaky cream cheese pastry, too, as I make Rugelach with them and make a chocolate filled version. YUM! Cannot wait to try these little chocolate wonton pies with Hershey Kisses. So sweet! How did I miss this one? What a GREAT IDEA Dan!! I can make these with my girls this week, so much fun even after Christmas! Have a wonderful Christmas! These are fun, and easy! I’ve heard suggestions of using sugar cookie dough or puff pastry in lieu of pie pastry – it’s all delcious to me!! Thanks for your great comments! I feel as if I should do this with some of the leftover candy cane kisses I have…instead of just, you know…eating them. Great idea! Thaks for the comments. For the record, in my book, just eating them always works, too!